We're having the best weather imaginable. Earlier today, I was doing some gardening and changed some of the burnt bulbs outside. I couldn't believe how much sand dust came out of the lights! I took the above photograph, of the Al Kout Mall, around this time last year. 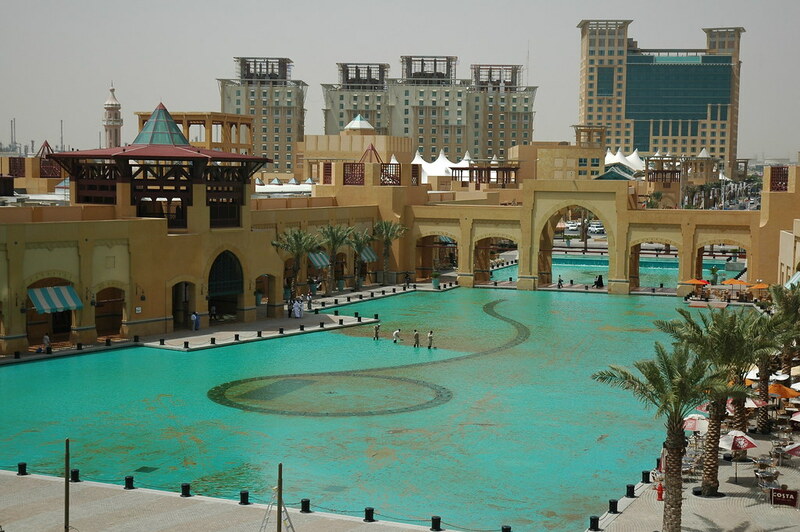 It was just after a major sand storm and the fountain was being cleaned. They started off brushing the sand under water. Have a look at the larger version. It takes a lot of work to keep Kuwait looking good! I hope this beautiful weather lasts a while. Your world is so wildly different from mine. That's why I like coming here to read about it. It gets me hungry for adventure. That is one great shot, I was wondering where you took the shot from! Very nice! The weather has been so nice, I don't want to stay in the house! I love the details you go into on your blog about taking photos. California is without doubt one of my favourite places to visit. I've been there with friends, and again with my wife. It's probably time we visited there with our children. There is a building at the end of the fountain area - by the sea - which is made to look like a lighthouse. You can go up the stairs and take a shot from this angle. I've been wanting to go in the night to get a shot of the fountains working with the hotel and apartments in the background. If you're planning this, take your tripod, it will be worth it. I would love to go and your blog helps to fuel the fire. Maybe some day soon when the world is a more peaceful place, as I wish to see a whole lot of countries in that region including Kuwait, Jordan and Iran. Well... It's safer than many people think. Kuwait is for sure safe (thank god) but I am also comfortable saying Jordan and Iran are relatively safe too. Though with an American passport, I don't know what the process is for entering Iran. Do let me know whenever you're planning a visit to Kuwait. AVOID THE SUMMER!! About time they start cleaning it! It looked horrible filled up with mud and filth.